Typography has always been an important factor in the success of a website. When it comes to WordPress, you will find tons of WordPress typography plugins. In this article, we will try to find out the best and list the top WordPress typography plugins. So, what makes typography so important? First, it paves the path to improving user experience where content plays an important role. It also improves the design of the website. 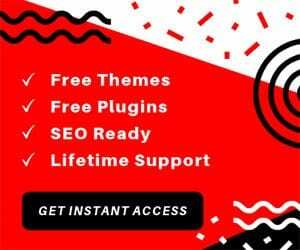 WordPress ecosystem has always been rich on plugins and themes. So, as a user, you don’t have to worry about your requirements. You can always get the plugin — both free and paid from the marketplace, and continue working on your project. Changing typography on the website require some coding knowledge. However, if you don’t know how to code, you can always use the WordPress typography plugins. Installing these typography plugins is also easy, and won’t take much of your time. Once installed, you can dive deep into the typography world, and change typography the way you want. 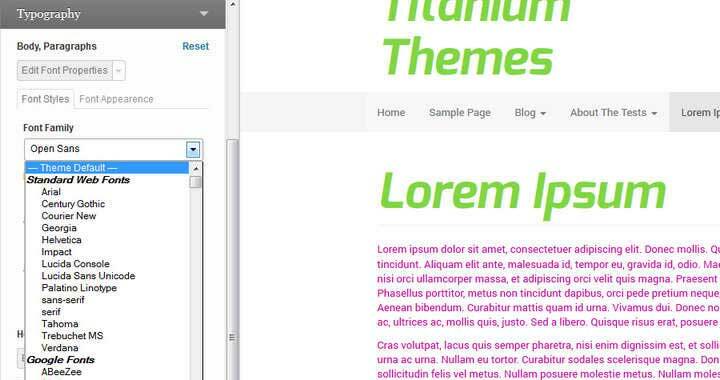 Most of the typography plugins for WordPress are also compatible with themes. If you are using a premium theme, the chances are that it already provides the ability to change typography. However, most of them are limited in nature. That’s where all the typography plugins come in. So, without any delay, let’s get started. You must be familiar with the rich font director that Google has made available to users for free. Well, with Google Typography plugin for WordPress you have access utilize more than 800 of these Google Fonts for your WordPress website. This WordPress typography plugin is super easy to use allows the option for font customization as well. 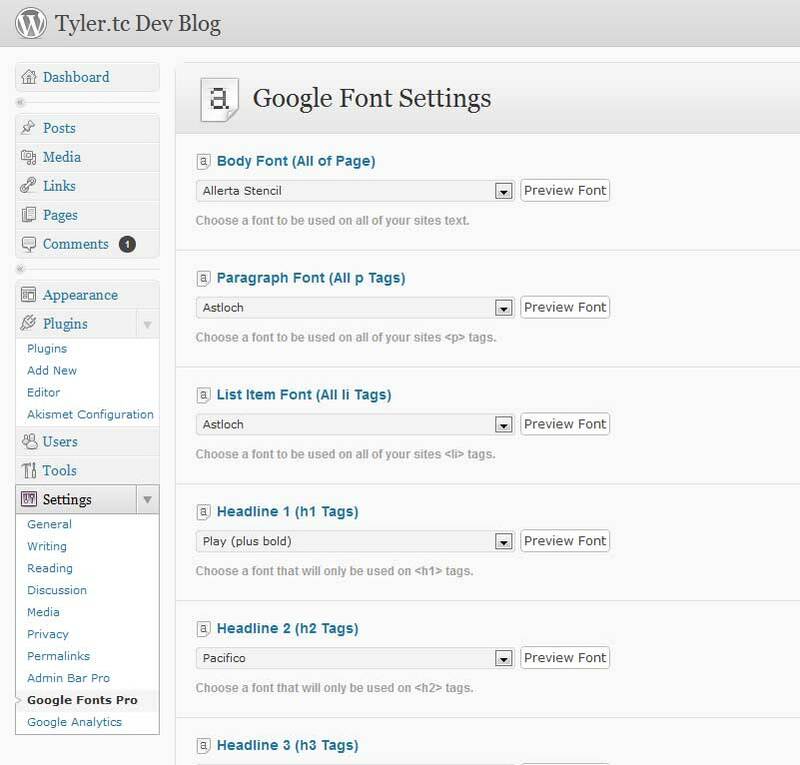 After installing the plugin, a Typography section will open up under the Appearance section of your WordPress dashboard. 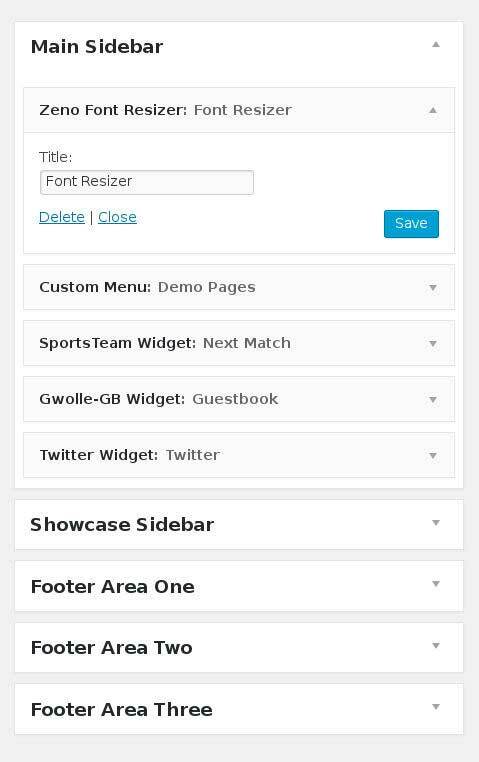 From here, you will get to add or customize the fonts and then apply them to HTML tags or CSS selectors. Styleguide WordPress typography plugin helps you to incorporate advanced font and color customization option to your WordPress website. With the plugin installed, you have the option to head on over to your WordPress customizer and start tweaking till your heart’s content. 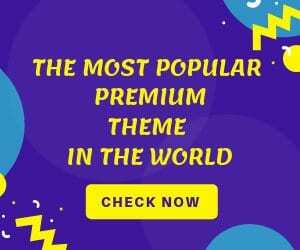 The theme comes loaded with around 45 different Google fonts, support for all default WordPress themes with more to come, and much more. There is also a font filtering option based on character sets. This can come in handy while searching for non-latin languages like Russian. Use Any Font is one of the most popular Typography plugins in the WordPress repository. The plugin allows you the option to use custom fonts on your website which can help you extensively and branding and proper customization of your site. You practically have the option to use any type of custom font you like, and all you will need is its associated ttf, otf, or woff file. This frees you from the limitation put on by other plugins where you only get to work with a limited number of fonts they provide out of the box. Furthermore, the plugin works perfectly with all sorts of themes and website builders so there will be no sort of compatibility issue. WP-Typography comes with a lot of typographic enhancement for your WordPress website so that your content looks great! The most notable feature of the plugin would be how it can automatically add hyphens whenever needed. Furthermore, it can also replace hyphens with en or em dashes. Besides this, can improve the default filtering of posts and pages to ensure better typography. It can even intelligently handle multiple elements on your site like quotes, dashes, copyrights, and other symbols. There is also support for around 50 different languages. Typography is not only about changing the font type and size. It is also about changing small stuff such as bold, strikethrough, headers and so on. TinyMCE Advanced is a free plugin that lets you customize your content the way you like. By using this WordPress typography plugin, you can change smaller things such as Font Family, background color, tables, font size and so on. TinyMCE Advanced also makes the visual editor toolbar more accessible by splitting it into four rows. It also allows the user to import CSS from the editor-style.css and tags from the text editor. Other key features supported by TinyMCE Advanced search and replace table insertion operations, more options while inserting lists, and so on. Easy Google Font WordPress typography plugin gives you the access to Google fonts from your WordPress dashboard. With this typography plugin for WordPress, you can import and use over 600+ google fonts. It is clearly, one of the best Google font plugins out there. It takes slight coding to use Google fonts as it needs importing and then using it. The plugin also gives full control of your website typography. Moreover, it comes with live preview options, where you can view the changes live and decide on the fly. If you like to change fonts more than often, you can also take advantage of the custom font controls. These custom font controls can be activated and used anytime from the admin area. The plugins work without editing your theme CSS files and will work on top of the website typography feature. There are many benefits of putting quotes on your website. However, it becomes really hard to put quotes within your contents, especially when you want to align them. This is where Perfect Pullquotes comes in. This WordPress typography plugin lets you insert quotes easily into your content with a simple drop-down menu option. The pull quote can be aligned, left, right and full-width. It simply uses the shortcode to do the insertion. You can also edit the shortcodes yourself and make it customizable according to your requirement. Many blogs rely heavily on sharing code related content to their audience. Code Colorer is a free WordPress typography plugin that lets you not only insert code snippets but customize them according to your taste. It comes with the support of all the main programming language. The plugin also provides granular control over your code where you can highlight either one single line of code or the comments. You can also go with the default code colorer snippets. You can also customize the colors via CSS as well. The plugin comes with nine preset color themes. Moreover, the code snippets come with automatic numbering. Zeno Font Reizer is a simple to use WordPress typography plugin that lets you resize fonts on the fly. For example, there might be some visitors who prefer smaller or maybe larger fonts while reading. By doing this, it becomes easy for the visitor to digest their content without straining themselves. If you want granular control of how fonts look and behave on your website, then Typekit Fonts for WordPress is your best choice. With Typekit, you can get more access to fonts, thanks to Adobe Typekit’s library. The library contains all the fonts you will ever need for your project. You can start using the free version, but it is very limited. Moreover, you don’t have to edit your theme for embedding Typekit. To make the most out of it, you need to subscribe to their subscription-based service. The biggest advantage of using Font I want is that it is compatible with multiple fonts provides including Google Fonts, Adobe Typekit, Font Squirrel. This gives you tons of opportunities and possibilities. If you want to use your creativity, the plugin also offers options such as multi-font combinations. By using multi-font combinations, you can combine two or more fonts from multiple providers, and set them on breakpoints. This means that you are using multiple fonts on your website at the same time. Other key features include font library manager, favorites, multifunctional control and so on. Google Web Fonts for WordPress is a paid WordPress typography plugin to access Google fonts repository. Even though there are plenty of free plugins that you can use to implement Google fonts, this paid plugin provides more control over the free ones. It comes with all the feature set that you will ever need to handle Google web fonts for your WordPress website. For example, it auto updates the font list whenever there is anything new. Not only that you will be able to create customized font rules using the inbuilt settings panel. The plugins also offer drag and drop feature set. By using it, you can simply select and drop the plugin without writing a single line of code. You can also take advantage of the Google Fonts Pro which requires an extended license. 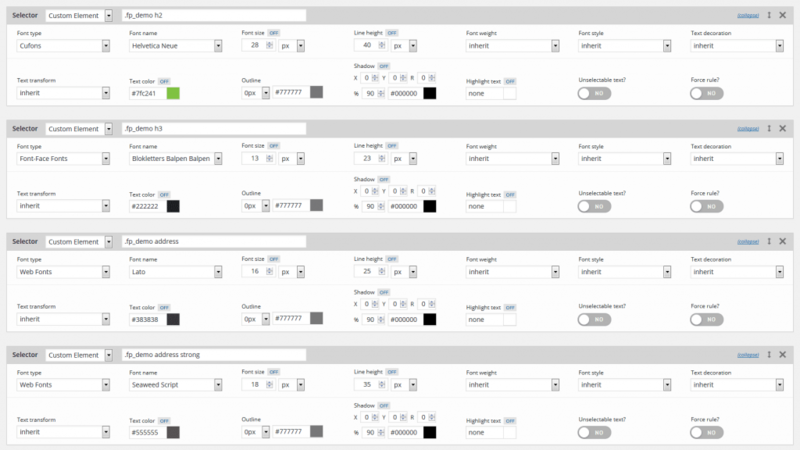 FontPress is a WordPress font manager that lets you manage your WordPress website typography. It is a complete tool and let you get the font from different online repositories including Adobe Typekit, Google, Cuffons, and so on. You can also integrate simple CSS fonts into your website. All the fonts that you will use on your website are completely responsive in nature. With the plugin, you can change font, size, weight, color, style and so on. This WordPress plugin for typography also works with builders and let you build a great website from the onset. You will also get seamless updates when something new comes. Using FontPress is also easy as it comes with all the necessary videos and documentation. With Font Master, you can take control of your fonts directly from your WordPress dashboard. Getting fonts right is the first thing that you will ever need if you want to attract viewers to your website. It comes with all the important stuff that you will ever need including uploading your font and access to 600+ Google fonts. It is also compatible with all browsers and supports multiple formats including SVG, EOT, WOFF, TTF, and WOFF2. The plugins also let you preview before you can use and implement the font on your website. Any Other WordPress Typography Plugins? Getting your typography right the first time is a difficult task. That’s why you need a typography plugin to test out different fonts on your website. The ability to test and quickly preview your website typography can give you an edge and save your precious time. In this article, we focused on both free and paid typography plugin. 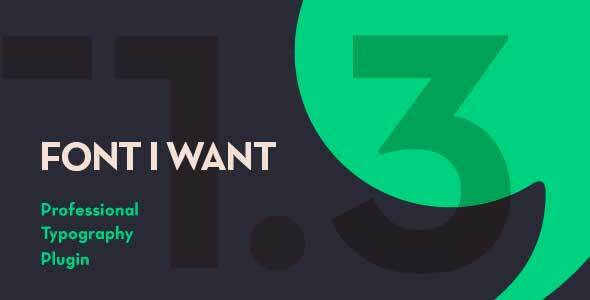 It is always better to start with a free plugin, however, if you want granular control and wants access to all the online typography repositories; it is always better to go with the paid plugin. So, which typography plugin you are planning to use? Comment below and let us know.